In our modern society, people tend to conform. It is getting increasingly difficult to be independent. There are virtually no unexplored areas. The medias impose upon us the images of what is “ideal”, what is “the norm”, to such an extent that all else is deemed undesirable (or even worse, “not real”). Overpopulation makes most landlubbers subject to ever more invasive laws and regulations aimed at ensuring peace between the multitudes. Economic realities prevent a vast majority of the population from devoting any kind of significant time to activities that are rewarding yet deemed unproductive. You know what I mean, things like star gazing, or spending a few hours lost in thoughts while sitting on a rock, etc. Rare is the person who is free to do what he wants, when he wants, with no associated guilt and no stress from a deadline. Consuming and producing are the back bones of modern economies, the wheels need to be kept turning, who is not busy at it is not pulling his weight. Such is the reality of life ashore. Mostly unknown to the struggling masses, there are many marginal alternatives. I won’t dwell on the others here, and will keep on the one that concerns us: sailing. It is not one available to everybody, not one to everybody’s liking either, but one that offers such rewards for so little compromise that I am certain that if more people were offered the chance to sample it, there would be a lot more tiny sailboats all over the ocean. 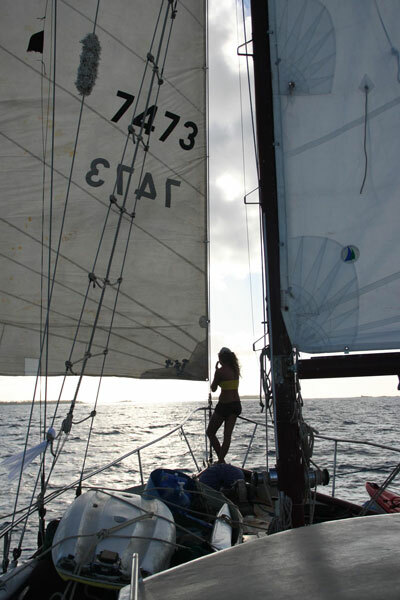 Sailing, or voyaging by sea, is in this day and age one of the most rewarding lifestyle I am aware of. And I’ve tried a few. The sailing lifestyle is nomadic. There are few true nomads left today. A lot of people are satisfied with sedentarism, but in my experience at least, many of those home based landlubbers chafe at the bit and most, given the opportunity, thrive in a nomadic life style. We seem to be built for it. Actually there is little doubt that we evolved for it. It’s in our genes. Yet in today’s society, nomadism is of a new kind, one that has its perks and also its downfalls. Not everybody likes it. A lot of people actually look down on nomads as parasites, freeloaders, useless vagrants. We can’t have 7 billions nomads on this planet either. So I’m am not trying to get everybody to do like me, far from it, but I, for one, can not conceive a return to a conventional shore based lifestyle. People often ask me when I plan to return to “real” life. For a long time I was baffled by this question. Now I found an appropriate answer. I tell them that they are mistaken, this is, for me, real life. My life afloat is very real indeed. It is the mindless lives of the cubicle worker, the fast food franchise cook, the insurance salesman, and all the others, that I consider lacking the “real” factor. What is the point of toiling day after day, selling the minutes of your life away for a few dollars and a few comforts? What do you get for it at the end? The life I chose is more real than most, I live less of it vicariously through a TV or a computer screen. Instead of waiting for my next vacation, I chose a life I do not have to escape from. There is a difference between living and surviving. I may lack security and steadiness, I may struggle and eventually I may go down burning, but at least I will have lived, not merely survived. Not to say that you need to go sailing to lead a real life, there are many other option, but to consider that my life on Karaka is not “real” life is simply failing to understand what life is about. To me, “real” life is not defined by what the majority does, life is “real” when it is made the most of, when it is not wasted. Whatever that means to you. A clarification is due. By “sailing” I am not, I insist, NOT, referring to “yachting”, also known as “messing about in boats”. No, no, no, I am referring to actually turning a sailboat into a home, and taking that home over the horizon with no return date, schedule or itinerary in mind. It is about living on a sailboat as opposed to using a sailboat for recreation. It is closer to wind powered vagabonding as opposed to engaging in a fancy hobby. The differences are significant. The major difference is that sailing as I mean it is accessible to everybody, even the young and poor. Especially the young and poor I am tempted to say. I am not talking about a rich man’s hobby, a retired couple’s last hedonistic throes or even an adventurer feat, but about a radical lifestyle choice. This is not for an elite only, as I hope the Karaka example shows clearly. Granted, it involves sacrifices and a certain attitude of humility, resourcefulness and independence that is not easy for everybody. It involves, quite literally, casting off and leaving everything behind, and not everybody is up for that, especially when lacking financial security. But for some, and you might be one of them, it is really worth it. Some of the rewards are obvious, some are not. If you are reading this it probably means you have considered the obvious ones and are tempted, yet joining Karaka is more than joining for a sailing trip, it is mostly a peak into that nomadic sea going lifestyle’s less obvious rewards that I enjoy and want to share. Curiosity about that lifestyle has to be one of the reason you are considering writing to me, otherwise, you are missing the entire point. One of the great appeal of the sailing mode of travel is without doubt the low negative impact it has on the environment. Granted, there is always an impact on the environment. But when sailing, you are de facto limiting that negative impact, and you can push it very far if you are so inclined, although usually at the expense of comfort and convenience so that a compromise is necessary. But compared to most other lifestyles, the sailing lifestyle offers enhanced opportunities, such as catching your own food, drinking rain water or using the wind to move around, to limit the guilt of affecting the world in a negative way. Another way sailing affects a person is in the rhythm of life. Not to generalize, but most people in modern western societies ashore are pretty frenetic, mostly because of schedules and deadlines and obligations and all that sort of things. On a boat like Karaka, you free yourself from those. The resulting peace of mind is hard to describe. Some can’t cope with it, they positively need a constant stimulus, but the true nomadic sailor just takes it easy. It is not so hard when sailing in the tropics, as most local populations, the ones in remote areas anyway, tend to take it very easy too. The “no rush“attitude is prevalent in the tropics. And by slowing down, you appreciate things more. You see more. You live more. And finally, maybe the best reward sailing brings is what I like to call: “the diet of the mind”. While there are plenty of opportunities to visit and enjoy busy places with a lot of social interaction, even in the harbor of a bustling city, you are somewhat removed from the pressures and demands of aggressive marketing and media propaganda. There is something very refreshing in not being constantly exposed to advertisement and television. It takes a while for most people to get used to it, as rare is the modern person who is not addicted to a constant stimulus, but eventually sailors wean themselves of it, by necessity. It is hard to describe to the frenetic addict of constant mental and visual entertainment what it does to your thought process when your brain is left to its own device for weeks on end. We lost track of how much the media has grown on us, and it takes a radical removal from it, such as a few weeks offshore or a few months in some remote islands, to appreciate how much it limits us, mentally, creatively, socially… It is very hard to think deeply or be very creative when constantly exposed to television and mass media. When is the last time you wrote something profound on facebook? How many hours do you spend everyday watching mindless entertainment? Yet when sailing offshore, with no or little stimulus to interfere, your mind is left free to wander. What comes out is different for all of us, but oddly, the first thing is usually a flood of resurfacing memories. Faced with remembering trivial or not so trivial aspects of their life (realizations and regrets and lost hopes and forgotten ideas), some encounter thoughts and feelings so scary and disturbing they declare themselves bored and give up sailing at the first opportunity, seeking comfort in the numbness of mind that is afforded to the media glutton by the “normal” life ashore. Others are reborn. They change tack, so to speak, turn off the autopilot, and take control of their life. Creativity is enhanced, philosophy becomes interesting again, eyes start to sparkle anew, as they were when at 6 years old, yet with the advantage of experience and all the extra years, and the result is often glorious. It is like a veil lifted from your eyes. You see the world differently, as a place full of wonders and opportunities, the sky is your limit, the horizon your friend, time your ally. Then of course you have to deal with that, and that can be another addiction. But I think the change is positive. Those are part of the reasons I live on a sailboat. I could go on for another few pages but there is a sunset going on, and I’m going on deck to have a shot of rum to celebrate the end of another amazing day with the rest of the crew. Somebody is tuning a guitar and I hear the clink of the glasses, it’s time to go. If you want to know more, you’ll just have to come and find out by yourself how it is “for real”. Another thing I want to mention on this page about sailing, is about me teaching sailing to the crew. I do, to the extent that I can, teach sailing to those who come on board, although Karaka is not a sail training vessel. I am not a qualified sailing instructor and won’t deliver any certificate. One thing that I need to say is that I think that learning by heart how Karaka (or any other boat) works, is near useless. It might help you while you are on Karaka but it won’t really make you a well rounded sailor. So although I enjoy answering questions and explaining things to those who actively try to learn, mainly I don’t spend much energy on teaching to people how to do things. I prefer to teach the attitude of figuring out how to do things. That way, people end up understanding wat they are doing instead of being automatons at my orders and more importantly, they gain confidence and the certitude that if they forget a specific knowledge, they will be able to figure it out again when needed. The amount of knowledge necessary to run a sailboat is staggering and few can claim to remember it all after a few months or even a few years sailing. After a while, with experience, things become natural, but for the beginner, the most important thing is to be able to correctly figure out what needs to be done and how it needs to be done. Sailing on Karaka definitely helps with that. I don’t like to teach what to think, I prefer to teach how to think. Karaka is a great boat. She isn’t a racing boat but in her good old ways, she is rather enjoyable. She is heavy and strong, comfortable and very forgiving. She has no fancy gear or labor saving devices such as roller furlers, auto pilot, electric winches or anything like that, so it can get strenuous to sail her, but with a good crew that actually makes going anywhere a very rewarding experience. Karaka has a low rig, meaning the masts are not very tall. She is a bit underpowered for her weight, but it is as well, since it makes her tougher and stronger, able to handle sustained rough conditions. 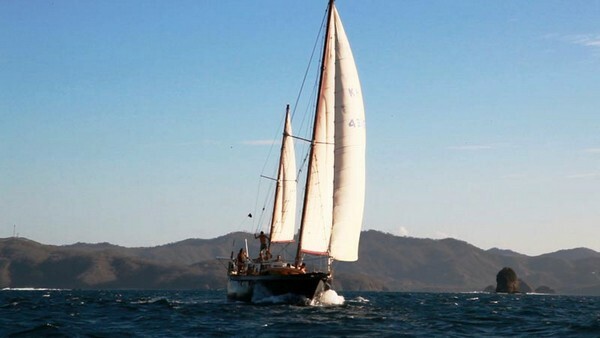 Karaka is a ketch and the ketch rig is very good for the kind of sailing we do. A ketch is a boat which has two masts, the tallest one being the front one. It has nothing to do with the hull, the ketch name relate to the rig. Karaka carries usually 3 sails, the mizzen on the small mast of the same name in the back of the boat, the main sail in the middle and the jib in the front. Both the mizzen and the main have booms, the jib is flying on the fore stay. There is no furling gear on Karaka, and the sails are hoisted and lowered everytime we use them. We have a wide selection of sails, to fit any conditions, from tiny storm sails to gigantic spinakers. There are 8 working jibs to choose from. We change them often while under way to adapt to the wind strength. The main and the mizzen both have reefs, so we can reduce the sail area when the wind get strong. The ketch rig has this advantage too that in case of a sudden squall, the main sail can be lowered without affecting too much the balance of the boat. Karaka is a well designed ship and we ‘ve been able to get her to steer for hours at a time without touching the wheel, a blessing when you don’t have an autopilot. It take a few adjustements to get the sails right and find the position of the wheel where the boat is going to bounce between too much pressure on the mizzen and too much pressure on the jib. She will scallop decreasingly until she stay on course, moving a few degres maximum, as long as the wind remain steady. The easiest way to adjust the course is by easing or trimming the mizzen and the jib. With this good ability to self steer, karaka is perfect for the use of a windvane. A windvane is a contraption mounted on the stern, that is adjusted in relation to the angle of the boat to the wind, and by means of a second rudder, a trim tab and a vane, all linked together mecanicaly, steers the boat at always the same angle to the wind. You are on a beam reach, you set the machine, and the boat will keep on a beam reach whatever way the wind turns. It doesn’t steer according to a magnetic compass, and there is no power required to make it run, only wind and boat speed. It is almost magical, and very enjoyable, after years of constantly steering by hand, to be able to do something else than sit behind the wheel during your watch. This particular windvane got its own history as well. I found it 5 meters underwater on a reef in Chagos, where a yacht had sank during a storm. With two crew members we dove several time to get all the pieces out. I installed it for the first time in Tanzania, after many modifications. It was working well across the indian ocean untill in very rough conditions, one of my mounts let go. It was then stored for months inside karaka until I fixed it and reinstalled it in South Africa. It failed again crossing the Carribean in 2009, got fixed again, but finally died on the crossing from Mexico to Costa Rica in 2012. Its final resting place is at the bar “La Vida Loca” on the beach in Playa del Coco, Costa Rica. We’ll do without from now on. Karaka sails better with a lot of wind, and a light breeze will require a lot of effort from the crew to get her moving, by setting big cumbersome sails everywhere they fit to catch the wind. 1 knot is 1 nautical mile per hour. 1 nautical mile is 1.852 Km. The maximum ever reached by Karaka that I can vouch for is 12.1 knots. I’ve been told by previous owners that they reached 13.5 knots. 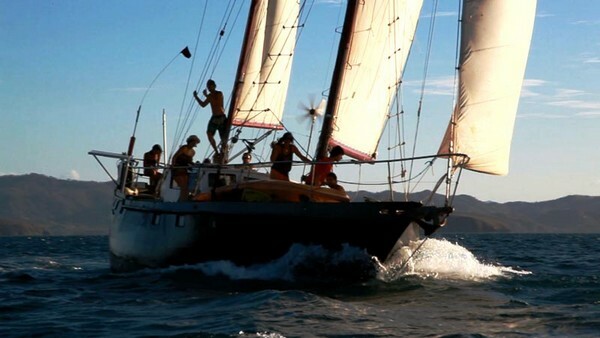 The best day run was sailing in South Africa from Durban to Port Elisabeth with 242 mile in 24 hours. And for those people who asked, during crossing, we don’t stop at night and we don’t anchor in the middle of the ocean. During watches, the crew on duty has to steer by hand, keep a look out for ships and fishing boats and check for changes in wind conditions and bad weather approaching. The inexperienced crew asks the captain or the other more experienced crew as soon as something unusual arises. When required, everybody helps with reducing or changing sails and with gibing or tacking. Navigation is done with the help of a GPS. The GPS system is giving us our exact latitude and longitude every second using satellite signals. The processor inside the GPS calculate for us our course, speed, and various other useful information. 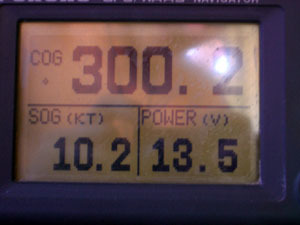 The GPS is linked to a laptop on the nav table, on which is installed C-map, a digital chart system. The screen of the laptop then shows a nautical chart of the area, with depth, land contour, navigational aids, and also our position on the chart, our direction, and it keeps atrack of where we came from. It almost replaces paper charts. I still have a wide array of paper charts nonetheless in case of computer failure, although my two laptops are equipped with C-map. Navigation is the duty of the captain, but I’m willing to teach this arcane art to anybody interested.